Thai Garden Hill Resort is located a few minutes walk from the north end of Klong Prao beach. It’s a good option for those on a budget or looking for more value than many of the beachfront resorts offer. The location isn’t the most scenic, with beer bars, a gas station and builders merchant being close by. But once you’re lazing by the pool and looking inland towards the hills then it’s a nice little hideaway. The rooms are in two storey bungalows, one room on each floor. These are clustered around the freeform pool. The reception and parking area is roadside and so the resort is very private. You won’t really notice traffic noise. As it’s a budget resort the rooms are a little dated and in need of some renovation but you get what you pay for. Guests who are disappointed tend to expect too much from a roadside two star place. If you don’t mind a few minutes walk to the beach and just need an aircon room and pool, then there’s no reason not to consider staying at Thai Garden Hill Resort. 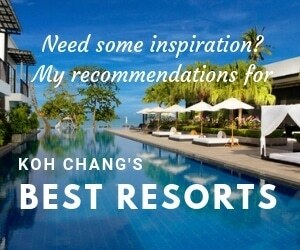 And for anyone interested in stayng longtemr the rooms can be rented on a monthly basis through the resort direct. I had a lovely experience at Koh Chang Thai Garden Hill Resort. The location is stunning. I’ve stayed here a couple of times before. Each room I stayed was good, not really exemplary, but fine for a two star resort. The staff always cleaned my room every day. They also changed towels every day. They also gave us free towels that we could use to the beach. The fridge in the room was filled with bottled water and a few chocolate bars. As always, the staff was warm and friendly. Each time I stay here, they always give me a welcoming smile, like I were a very important person. My friends and I learned some Thai language so we could somehow converse in simple Thai. Our room didn’t have a good Wi-Fi connection, we had to go out to the lobby to get a signal. Sadly, it was very slow. ( On previous visits it was fine.) It took a few seconds (minutes) before I could open Facebook. It was truly horrible. in the end we resorted to using our cellphones and getting new SIM cards from the nearby 7-eleven. Although we had a great room, we didn’t enjoy the flat screen TV. The signal was bad. But we didn’t stay there for the TV. We were there to enjoy the Thai life, even for just a few days. The room was tastefully furnished but not really outstanding. But they do have thin walls. This means that you can hear your neighbors next to your room. At that time, there was no one staying next to us. But it might get noisy if there’s a group of partiers next door. For an island hotel, it’s pretty good value. Good thing was that they provided quality service. Our room was not too spacious but we easily fit in. It could use revamping as the décor is a little outdated. Going to their swimming pool was just a short walk. Their garden was well-kept. When we needed to go to White Sand beach, we had grabbed a local pick-up truck taxi from right outside the resort. We were told we could hire a scooter at the resort but we’ve never ridden these before. Our breakfast was offered with reasonable selection of American and Thai food. Just the usual eggs, ham, toast and jam. Plus tea and coffee. I gave their breakfast buffet a passing grade. In the reception area, they have a fridge filled with beers and sodas. And no, they aren’t free. But it’s convenient to grab one when you come back from a day trip. One of the best assets of Thai Garden Hill is their swimming pool. It was clean and the staff manning the area was friendly. From the hotel, we could walk to Chaichet and a busier area with some very good restaurants plus a bank and supermarket. Try the noodle stall outside the supermarket. Or if you like kebabs there are a few places selling them from mobile stalls by the roadside. Although the location isn’t so beautiful and there are quite a few beer bars nearby, it was fairly quiet at night. We had a great sleep quality. During our last night here, there was a wedding reception. It was rather loud. We immediately called the staff and they apologized for the inconvenience. But the noise didn’t stay long. As soon as we were about to sleep, the entire hotel became as quiet as it was the night before. The manager of the hotel apologized again for the inconvenience. He made sure that our stay was comfortable. We were truly grateful for that effort. Other hotels might just shrug off the incident as they couldn’t control the scene. Service-wise, the hotel was great not awesome. They have great cleaning staff. They were also forgiving with our limited Thai. Their rates weren’t cheap but we experienced quality service. I will still choose this hotel if I’d come to this area again, since I’m already accustomed to its style.